You may be apprehensive to try a different carpet cleaning company, even if your current carpet cleaning companies work is just not up to par. You may be tempted to try a carpet cleaning company that advertises incredibly low prices in the coupon mailers. Before you make a move, take a look at Griffith Carpet Cleaning NJ. We are proudly locally owned and operated since 1999. We didn’t just set up shop like the other franchise carpet cleaning companies. Over the years, we have established a loyal customer following. We use the preeminent truck-mounted Blue Line Thermal Wave II 5M carpet cleaning machine for hot water extraction. Our trucks have the capability to carry fresh water for cleaning. We understand that our customers live within certain budgets. That’s why we work with them to develop a cleaning plan based on their needs and budget. We offer free estimates and a 5% discount on labor for jobs over $200.00 to all carpet and tile cleaning customers. The IICRC is a non-for-profit guardian for the cleaning, inspection and restoration service industries for more than 30 years. To qualify for IICRC Certified Firm status, businesses must demonstrate proof of insurance, maintain a written complaint policy, and provide ongoing education and training for all technicians. We are continually expanding our training. .
We strive to continually improve our service by keeping up with the latest changes in carpet cleaning systems, carpet cleaning chemicals, and service options. 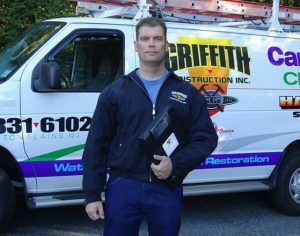 Call us at 973-831-6103 to discover the Griffith Carpet Cleaning NJ difference.